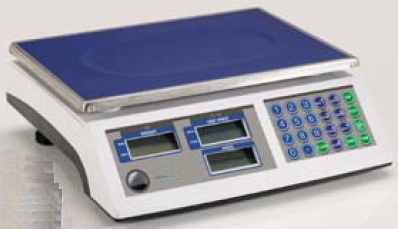 Compact and portable counting scale with large plate, ideal for rentals and inventories, with pieces' totalisation function. 8 PLU memory. 3 backlit LCD displays for simultaneously viewing the weight, average piece weight and number of pieces. Mechanical waterproof numerical and functional keypad with 24 keys and acoustic feedback. Stainless steel plate, 235x335mm size. Built-in rechargeable battery 4Vdc (about 100h battery life) and 230Vac power adapter. Packaging: 380x138x370mm size - approximate weight of 4kg.